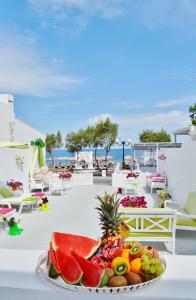 Sunrise Studios offers spacious and modern accommodation on the beach of Kamari. It is located at 100 meters from the bus station of Kamari and provides car rental and organization of excursions. 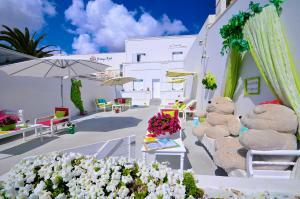 Studios with panoramic views of the Aegean Sea. Double studio with views, balcony and air conditioning. This cave house of 2 levels is elegantly decorated and consists of 2 bedrooms, fireplace, fully equipped kitchen, dining room, seating area and outdoor seating and dining area.